It’s hard to believe it’s been two years. Well, two years ago yesterday. The hardest day of our lives. We lost our sweet, sweet boy, our one-in-a-million, our fellow adventurer, our pink-bellied charmer. Only eight years old. We all fought the cancer as hard as we could. Maybe longer than we should have, before we took him for that last ice cream cone and held him as tightly as we could in our arms as he took his last deep breath. He’d been with us almost as long as we had been with each other, and we weren’t sure how to be without him. Life has gone on, life has still been good to us, but we lost a certain innocence, the sense that we lived a charmed life. And yet we know how lucky we were to have had him; to have gotten to share his life when everyone who met him loved and adored him. We got to know him best, he slept in our bed every night, he went with us to Berlin, he was our boy. Oh, how we still miss him. Technically, he had white fur, but it was so short, and his belly so bare, that he looked more pink than anything. He was overjoyed to see us, as though he’d been waiting just for that moment when our eyes met his. His whole body wagged and wobbled with pleasure, his green eyes blurred with motion, his red watercolor nose, its color spilling onto his surrounding skin, pushed towards us. His ears stood out from his head at odd and delightful angles, one straight, one flopping over at the tip. We put the camera aside — he’d be too hard to photograph right now anyway — and instead, we gave in to his affection. He licked our faces, nibbled our ears, climbed in our laps. As we laughed and hugged and petted him, we noticed he was slowly starting to swell. His face looked even pinker than before, and lumps were appearing under his thin white fur, covering his body. Tony stayed with him while I ran for help. The shelter staff had seen this sort of thing before — he was having an anaphylactic reaction to the vaccine he’d just received, and he needed an antihistamine shot immediately. One of the staff members grabbed him, put him in her car, and headed for the vet’s office. We had to leave before the staff member returned with him, but we couldn’t stop thinking about that sweet, pink boy. 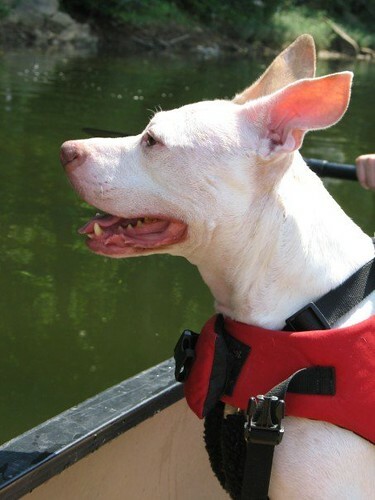 The shelter staff had named him Petey, after the Little Rascals’ pit bull, but the name didn’t seem quite right to us. Not that it mattered. After all, we were leaving for our junior year abroad in Germany in less than a month, and we certainly weren’t about to adopt a dog. Nevertheless, the next day found us back at the shelter to check on the patient. He greeted us just as happily, though he was maybe not quite as pink as he had been the day before. We spent a disproportionate amount of time visiting this happy boy. While we normally made it to the shelter once or twice a week, we were finding ourselves there daily. It was exam time, so we would lug our books the three miles to the shelter, and spread out a blanket in the grass to study with Petey. He would sprawl happily beside us on his belly, legs stuck out straight behind him, snoring contentedly. Days turned into weeks, and the end of the school year approached, bringing closer our departure date for Germany. 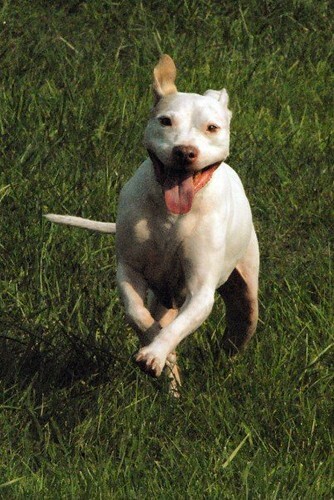 Our days with Petey began to be shadowed in sadness, until one day we decided we just couldn’t leave him. Another volunteer declared herself willing to keep him at her house for a month while we traveled and then found an apartment in Berlin. Dan volunteered to pick him up at the volunteer’s house and drive him to the airport. 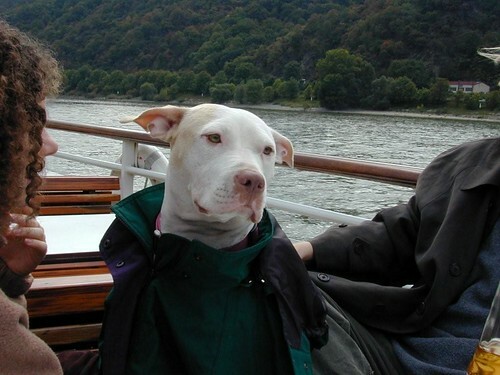 Our parents declared us insane — or rather, Tony’s parents did — my mom was so horrified, she hung up on me for the first and only time in my life when I told her we were adopting a pit bull and taking him to Germany. We saw the complications and difficulties multiplying, but we didn’t care. We were elated, we were happy, we were in love. Now that he was ours, we could find the right name for him, too, and we chose Bogart, though he quickly became known as Bogie, or Bogieman, the Boge, the Man, the love of our lives. 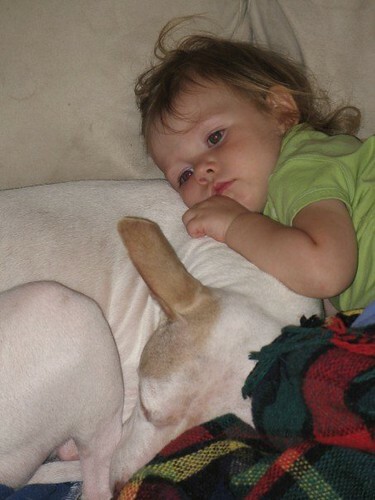 Oh Em…… he really was a sweet sweet pup. I know there will always be a big hole in your hearts; missing that pink-bellied-baby-boy….. I sure do hope I’m wrong about it all and that he really is running in green fields in some kind of an ever after…. Aww… He’s beautiful! Your story brought tears to my eyes. We have a pit bull, too, and she’s the sweetest pup ever. I love all the photos and I’m so sad that you all had to say goodbye. I just came across your lovely blog and was moved to tears with this story. There is a papallel here. I also lost a dog two years ago. Like you had your sweetie 8 years I had Heather a black lab/pointer cross rescue pup for 8 years. I lost also her to cancer. Just like your darling my precious Heather would show her love, affection and joy with her whole body. she had the most intelligent,knowing eyes. She was Amazing. I loved her like a child. Ohhhh, I miss Bogie too. You were so lucky to have him in your lives.